Scott Smart, FIM Technical Director - "In 2013 they introduced the EVO Class and it was agreed it would run through 2014 with the regular Superbikes, and again it would continue into 2015 and be the rule for the entire class. However, since that time we've made amendments to the rules to allow more manufacturers to be completive. Because as the EVO rules as they currently stand, certain manufacturers are going to stand out with stronger motorcycles. So the rules haven't changed a lot…. There's pretty much going to be the same chassis. Currently the EVOs and the Superbikes run with the same (production) chassis. 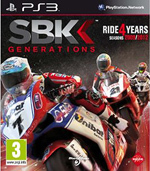 For next year (2015) it is going to be just one class, all Superbikes. Tthe big differencefor 2015 is going to be in the electronics. Right now the factory teams have a big advantage with the electronics, because they work very hard to develop them, and that disadvantages the smaller teams in the Paddock. It also means, if you are a smaller team you're never going to have enough staff and technology(develop your electronics) to be able to compete. Now for next season, each manufacturer is going to be allowed (required) to provide a "Superbike Kit". In that Kit you are going to have all the electronics that are going to be needed on the bike. And that kit has to be available, and it's tightly price capped. So every team in the paddock running the same (brand) machinery will for EU $8,000 get exactly the same electronics as the factory team. And several times throughout the year the software developed by the factory teams has to be given to the smaller teams. So all the teams in the Paddock are going to know they are going to have the same equipment as the factory guys. The only other small changes is going to be with the the throttle bodies. The throttle bodies play a very important role with the electronics now days for the control of the bikes. All the teams that don't currently have a Drive By Wire system will be allowed to modify their bikes to have Drive By Wire on them. Some teems obviously don't have Drive By Wire yet, so we'll allow them to have it, and that stands for the next 2 years. After 2 years, which is the 2017 season, all the manufacturers, irrespective of how their road bike comes, will have to run with homologated standard throttle bodies. So in 2017 the bikes you'll see on the track are pretty much the bikes you can buy from the dealership (with the exception of the higher end homologated suspensions which will still can be used in Superbike- Ed). Now by allowing this, this allows the manufacturers still running with throttle cable operated throttle bodies, to be much more competitive. And because they will be racing with it (Ride By Wire), they will now have the technology in place with the ECU. They are not going to have to go backwards in development. So all the work they do in 2015 and 2016 can be continued in 2017. So its going to be quite and exciting time. What it allows is, its going to make the Championship a bit cheaper, its going to require a few less staff in the garage, but above all its going to allow the smaller teams to be on a much more equal footing with the big factory teams." June 12th, 2014 - The Superbike Commission, composed of Messrs Javier Alonso (WSBK Executive Director), Ignacio Verneda (FIM Executive Director, Sport) and Takanao Tsubouchi (MSMA Representative), met at Barcelona-Catalunya Circuit on 12 June in the presence of Messrs Daniel Carrera (WSBK Championship Director) and Gregorio Lavilla (WSBK Sporting Director ). 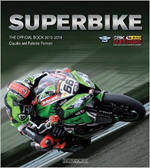 The main pillars of the technical regulation 2015 were approved by majority inside the Superbike Commission. In 2015 the Championship will return to one technical platform. The rules were previously agreed to be as the 2014 EVO regulations and they have formed the basis of the 2015 rules. However amendments have been made to ensure parity of performance across the diverse range of machines in the championship and the regulations are also aimed at both reducing annual costs and making the Championship more accessible to new teams. Remain largely unchanged excepting some clarifications to several points. The tolerances applied in measuring frames have been removed. The previously agreed EVO regulations form the basis of the 2015 rules. However due to the very limited options available to ensure parity of performance between different motorcycles the level of tuning opportunities has been increased. The FIM Superbike World Championship remains the last high level championship open to the manufacturers to develop their electronic control strategies. The manufacturers will therefore be allowed to continue to develop the electronic solutions but these systems must be available to all other teams using the same make of machine and it will be called the ‘’Superbike Kit System’’. For the 2015 and 2016 season the regulations will continue to allow the addition of Ride By Wire (RBW) systems to the throttle bodies. These systems must become available to all the other teams using the same machines. 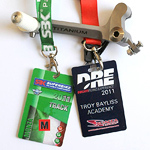 They will work hand in hand with the ‘’Superbike Kit Systems’’. For the 2017 season and onwards the regulations will mandate the use of the standard throttle bodies. *Complete provisional document will be available in the following days at FIM WEBSITE. There was an official request from a team to slightly increase the number of engines available for 2014. The Superbike Commission refused this possibility by majority. 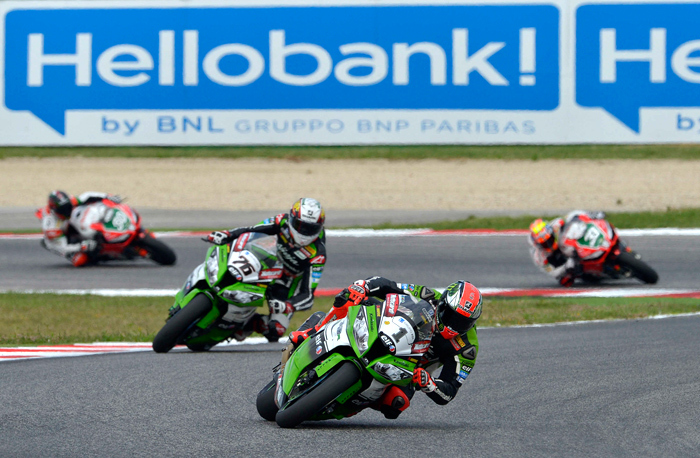 Misano, Italy, Sunday June 22nd 2014 – Following a difficult weekend in Sepang, the Kawasaki Racing Team was back on top form at Misano – in front of the 59,424 spectators attending over the three days – with reigning Champion Tom Sykes taking the double, Loris Baz finishing with a brace of second places and David Salom leading the EVO field in both races. Thanks to his third double of the season, Sykes has now a 39-point advantage over Sylvain Guintoli (Aprilia Racing Team) and 41 over teammate Baz. Despite still being second in the standings, Guintoli was on the back foot today at the Misano World Circuit, missing out the podium and being edged again by his fellow works Aprilia rider Marco Melandri, who completed the podium in the two WSBK encounters of the seventh round. Jules Cluzel (MV Agusta Reparto Corse) claimed the race win in World Supersport, while local rider Lorenzo Savadori (Team Pedercini Kawasaki) was victorious in the FIM Superstock 1000 Cup outing. The eni FIM Superbike World Championship will be back in action in a fortnight’s time, as the series heads to the Portimão’s Autodromo Internacional do Algarve, for the first of two back-to-back rounds before the summer break. Sylvain Guintoli: “Title race wise at least I am holding onto second place but I definitely was expecting more. The top speed was there but we need to find consistency in our race pace especially in the second half. In Race 1 we made the wrong tyre choice, whereas in the second outing we made some adjustments to close the gap to the leaders. While I was with Marco and Baz I made a few mistakes which kept me from battling for the podium in the end. It's a shame there is no Race 3. Anyway, we need to keep working to be more consistent in the race”. Both races would see Kawsaaki's Tom Skyes (1) pulling away from team make Loris Bazz (76) who held off Aprilia's Marco Melandri (33) and Sylvain Guintoli (50). 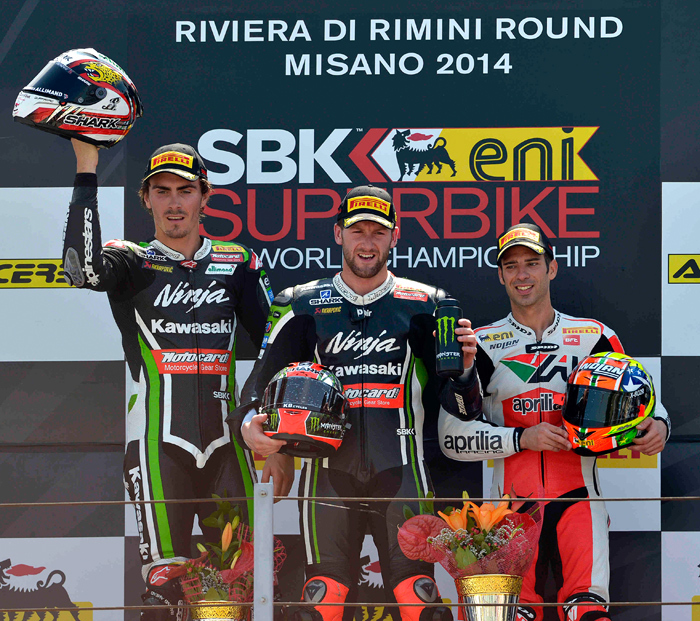 Misano (Italy), Sunday 22 June 2014 – After 21 fast and furious laps, Tom Sykes (Kawasaki Racing Team) has won the opening race of the day at the Misano World Circuit – Marco Simoncelli after starting from Pole Position courtesy of his record breaking lap yesterday. This is the 19th individual WSBK race win, the first one at Misano, for the British rider, who extends his lead in the title race to 27 points over Sylvain Guintoli (Aprilia Racing Team). 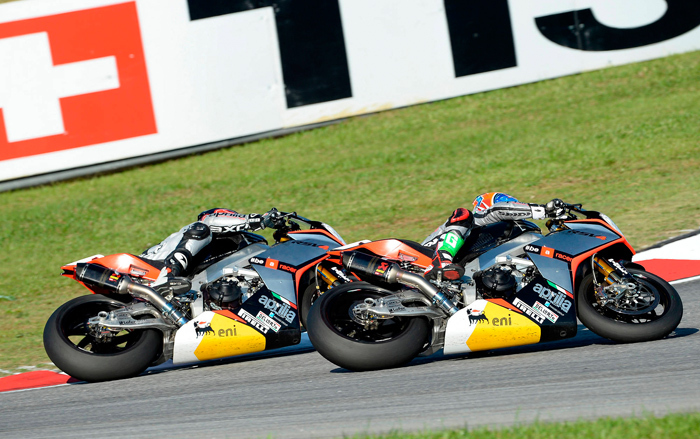 Loris Baz (Kawasaki Racing Team) and Marco Melandri (Aprilia Racing Team) took the remaining podium positions by finishing second and third, respectively. From the start however it was Toni Elias (Red Devils Roma Aprilia) that took the holeshot before reigning champion Tom Sykes forced his way past towards the end of the opening lap. Both factory Aprilia riders made small mistakes before regrouping allowing Loris Baz through to give chase to his Kawasaki team mate. Elias overshot at the start of lap 3 into turn one whilst the battle at the front was intensifying. As the race progressed the battle at the front was fast becoming a two rider affair with the fight for the final podium place now involving both Ducati riders as well as the two factory Aprilia machines, Elias and the Pata Honda of Jonathan Rea. As the race entered the final third Sykes was pulling away from Baz by 2 tenths of second leaving the Frenchman a lonely second. The final podium fight was now between Marco Melandri (Aprilia Racing Team) and Chaz Davies (Ducati Superbike Team) with Melandri eventually grabbing 3rd at the flag. Chaz Davies, Sylvain Guintoli and Toni Elias completed the top 6. David Salom (Kawasaki Racing Team) came out on top in the EVO battle after working his way through the pack after being caught mid pack in the opening sequence of corners, eventually finishing a respectable 11th overall. 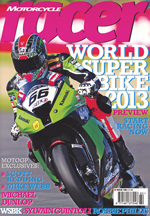 Alessandro Andreozzi (Team Pedercini Kawasaki) and Alex Lowes (Voltcom Crescent Suzuki) crashed out unhurt. Frenchman Fabien Foret (Mahi Racing Team India Kawasaki – EVO) retired on lap 10, after starting the race from the pit-lane due to a technical infringement found on his ZX-10R. Superbike Race One Results: 1. Sykes (Kawasaki) 21 Laps/88.746 km in 33'46.932 average 157.620 kph; 2. Baz (Kawasaki) 5.012; 3. Melandri (Aprilia) 6.417; 4. Davies (Ducati) 7.783; 5. Guintoli (Aprilia) 16.248; 6. Elias (Aprilia) 17.399; 7. Rea (Honda) 21.162; 8. Giugliano (Ducati) 26.393; 9. 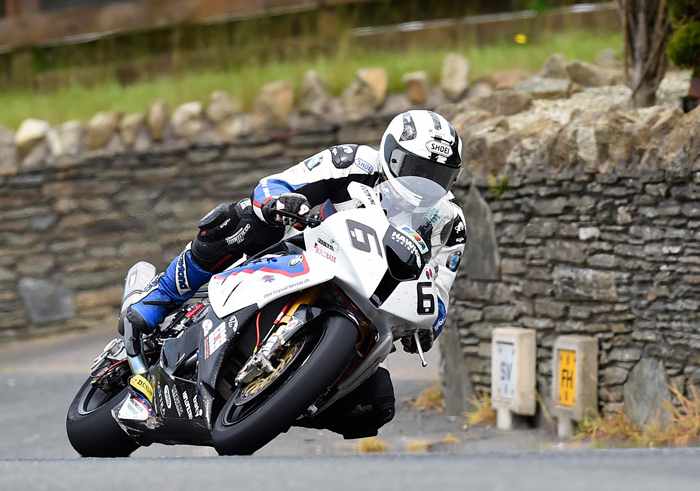 Laverty (Suzuki) 26.842; 10. Haslam (Honda) 40.600; 11. Salom (Kawasaki) 42.064; 12. Canepa (Ducati) 46.804; 13. Corti (MV Agusta) 48.909; 14. Goi (Ducati) 50.429; 15. Barrier (BMW) 52.452; 16. Guarnoni (Kawasaki) 1'02.476; 17. Russo (Kawasaki) 1'11.815; 18. Staring (Kawasaki) 1'23.649; 19. Sebestyen (BMW) 1 Lap; RT. Morais (Kawasaki); RT. Lowes (Suzuki); RT. Yates (EBR); RT. Foret (Kawasaki); RT. Baiocco (Ducati); RT. Andreozzi (Kawasaki); RT. May (EBR); SH. Badovini (Bimota) 46.219; SH. Iddon (Bimota) 53.155. What might have been - Ducati's Davide Giugliano beat Tom Sykes into Turn One off the Start in Race Two and became to pull out a half-second lead each lap, only to be boarded with a Ride Through Penalty for jumping the start by just an inch when the lights went green. The Ride Through dropped him back to last place, which he improved back to 9th/ 33 seconds behind by the end of the race. After winning the opening race of the day reigning champion Tom Sykes was victorious again in race two putting in a commanding performance aboard his Kawasaki Racing Team machine. It was the 20th career individual race win and the third double in the season for the Brit, who is now one success short of two time WSBK Champion Max Biaggi. Behind Sykes there was an intense race long three rider fight for the final places on the podium with Loris Baz (Kawasaki Racing Team) eventually grabbing 2nd ahead of Marco Melandri (Aprilia Racing Team) after some hard but fair overtakes between the pair. Sylvain Guintoli (Aprilia Racing Team) having to be content with fourth. An equally exciting scrap behind the top four saw Jonathan Rea (Pata Honda World Superbike Team) emerge 5th ahead of Toni Elias (Red Devils Roma Aprilia),, Eugene Laverty (Voltcom Crescent Suzuki) and Alex Lowes (Voltcom Crescent Suzuki) who was 8th. Race 2 was over before it had begun for Davide Giugliano (Ducati Superbike Team). The Italian who had finished 8th earlier in the day took the lead into turn one but was judged to have moved before the lights went out and was given a jump start penalty. He would eventually finish 9th after serving a ride through the pits for his mistake. Ducati’s other rider Chaz Davies crashed out of fifth on lap 5. In the EVO battle the accolade of being the best classified finisher went once again to David Salom (Kawasaki Racing Team) despite a valiant race from Sylvain Barrier (BMW Motorrad Italia) on his return to racing. Christian Iddon (Team Bimota Alstare - EVO) highsided out of contention early on but was thankfully able to limp away. Fellow Brit Leon Haslam (Pata Honda World Superbike Team) crashed out of the fight for fifth. Unlike Iddon, Haslam did remount to finish 12th. Superbike Race Two Results: 1. Sykes (Kawasaki) 21 Laps/88.746 km in 33'55.695 average 156.942 kph; 2. Baz (Kawasaki) 3.083; 3. Melandri (Aprilia) 3.413; 4. Guintoli (Aprilia) 5.092; 5. Rea (Honda) 18.975; 6. Elias (Aprilia) 19.365; 7. Laverty (Suzuki) 20.177; 8. Lowes (Suzuki) 20.439; 9. 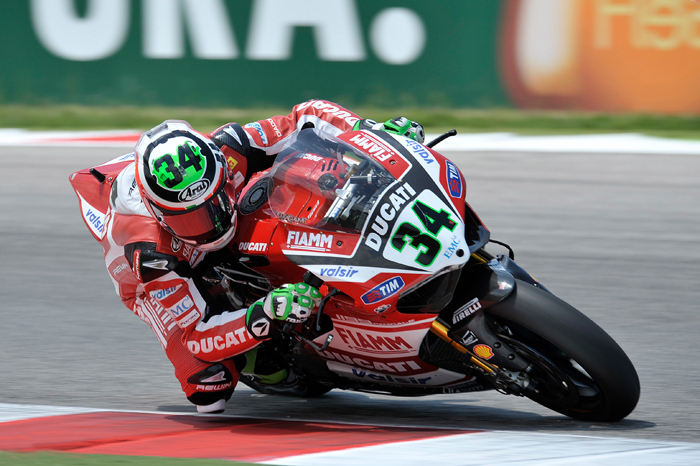 Giugliano (Ducati) 33.820; 10. Salom (Kawasaki) 42.156; 11. Barrier (BMW) 43.581; 12. Haslam (Honda) 51.993; 13. Goi (Ducati) 53.714; 14. Russo (Kawasaki) 59.316; 15. Andreozzi (Kawasaki) 1'00.914; 16. Canepa (Ducati) 1'01.839; 17. Corti (MV Agusta) 1'07.178; 18. Staring (Kawasaki) 1'13.510; 19. Sebestyen (BMW) 1'31.715; RT. Guarnoni (Kawasaki); RT. May (EBR); RT. Davies (Ducati); RT. Morais (Kawasaki); NS. Baiocco (Ducati); NS. Foret (Kawasaki); SH. Superbike Standings (Round 7 of 13): 1. Sykes 251; 2. Guintoli 212; 3. Baz 210; 4. Rea 199; 5. Melandri 179; 6. Davies 143; 7. Giugliano 111; 8. Elias 109; 9. Laverty 106; 10. Haslam 99; 11. Lowes 88; 12. Salom 67; 13. Canepa 43; 14. Camier 30; 15. Guarnoni 19; 16. Scassa 16; 17. Foret 14; 18. Corti 13; 19. Morais 10; 20. Andreozzi 9; 21. Barrier 6; 22. Allerton 6; 23. Bos 5; 24. Goi 5; 25. 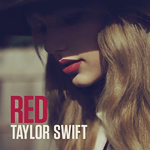 Staring 3; 26. Russo 2; 27. Toth 2; 28. Fabrizio 2; 29. Lanusse 1. Manufacturers: 1. Kawasaki 266; 2. Aprilia 244; 3. Honda 199; 4. Ducati 178; 5. Suzuki 156; 6. BMW 42; 7. MV Agusta 13.
s expected following a close qualifying session today’s World Supersport race was action packed from start to finish with multiple position changes at the front throughout the 19 lap encounter. Pole Position setter Jules Cluzel (MV Agusta Reparto Corse) led from the start and immediately began stretching a lead of over the chasing group of riders that included Kenan Sofuoglu (Mahi Racing Team India Kawasaki), Michael van der Mark (Pata Honda World Supersport Team), Raffaele De Rosa (CIA Insurance Honda) and PJ Jacobsen (Kawasaki Intermoto Ponyexpres). With Cluzel almost two seconds clear De Rosa crashed out of contention on lap 4 leaving Jacobsen, van der Mark and Sofuoglu to battle for the second and third places on the podium. With five laps to go championship leader van der Mark had reduced the gap to Cluzel to under a second setting up another tense final few laps between the pair. At the flag Cluzel took the victory, his second of the year by 1.5s from championship leader van der Mark with PJ Jacobsen taking 3rd and his maiden world championship podium. 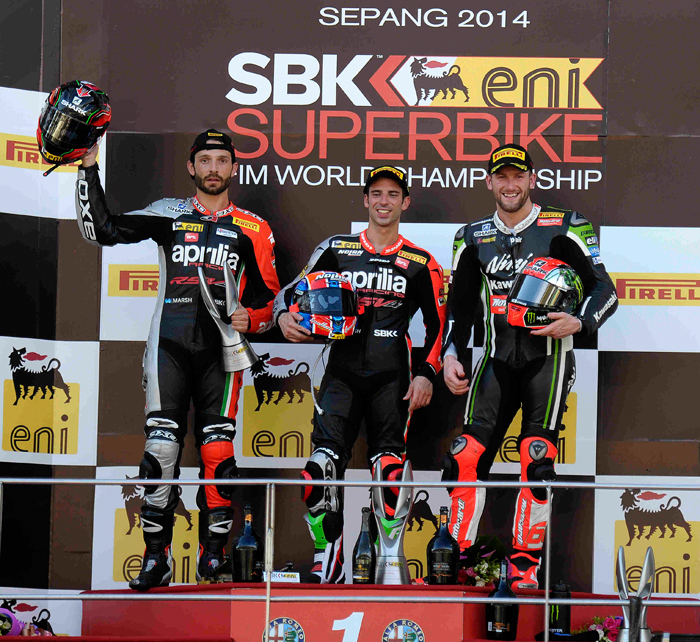 Former champion Kenan Sofuoglu finished fourth with Roberto Tamburini (San Carlo Puccetti Racing) and Lorenzo Zanetti (Pata Honda World Supersport Team) completing the top six. Supersport 600 Results: 1. Cluzel (MV Agusta) 19 Laps/80.294 km in 31'40.587 average 152.089 kph; 2. Vd Mark (Honda) 1.537; 3. Jacobsen (Kawasaki) 3.400; 4. 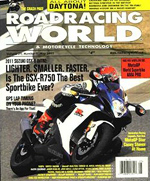 Sofuoglu (Kawasaki) 5.638; 5. Tamburini (Kawasaki) 9.923; 6. Zanetti (Honda) 11.018; 7. Marino (Kawasaki) 14.714; 8. Coghlan (Yamaha) 17.365; 9. Wilairot (Honda) 21.337; 10. Rolfo (Kawasaki) 22.215; 11. Nocco (Kawasaki) 22.407; 12. Kennedy (Honda) 22.641; 13. Wahr (Yamaha) 28.443; 14. Roccoli (MV Agusta) 30.202; 15. Gamarino (Kawasaki) 33.760; etc. Supersport Standings (Round 7 of 12): 1. Vd Mark 135; 2. Cluzel 107; 3. Marino 85; 4. Zanetti 70; 5. Coghlan 68; 6. Sofuoglu 67; 7. Jacobsen 56; 8. Rolfo 55; 9. De Rosa 54; 10. Tamburini 48; 11. Wilairot 30; 12. Bussolotti 27; 13. Wahr 26; 14. Russo 25; 15. Kennedy 23; 16. Gamarino 22; 17. Menghi 19; 18. Nocco 16; 19. Leonov 15; 20. Gowland 9; 21. Zaidi 7; 22. Coveña 7; 23. Schmitter 3; 24. Calero 3; 25. Roccoli 2; 26. Rogers 1. Manufacturers: 1. Honda 156; 2. Kawasaki 119; 3. MV Agusta 115; 4. Yamaha 78; 5. Triumph 9. Results: 1. Savadori (Kawasaki) 10 Laps/42.260 km in 16'43.398 average 151.621 kph; 2. Mercado (Ducati) 5.534; 3. Massei (Ducati) 5.666; 4. Jezek (Ducati) 6.897; 5. McFadden (Kawasaki) 8.492; 6. D'Annunzio (BMW) 8.627; 7. Lanusse (Kawasaki) 14.038; 8. Lussiana (Kawasaki) 14.396; 9. Valk (Kawasaki) 16.683; 10. Smith (Honda) 17.205; 11. Nemeth (Kawasaki) 18.848; 12. Calia (Aprilia) 18.964; 13. Muresan (BMW) 22.066; 14. Egea (Kawasaki) 23.302; 15. Alarcos (Kawasaki) 24.930; etc. Standings (Round 4 of 7): 1. Mercado 72; 2. Savadori 58; 3. Jezek 58; 4. Massei 44; 5. Valk 39; 6. Lussiana 39; 7. McFadden 38; 8. Lanusse 37; 9. D'Annunzio 30; 10. Smith 22; 11. Nemeth 22; 12. Day 21; 13. Bergman 13; 14. Muresan 11; 15. Grotzkyj G. 10; 16. Pagaud 10; 17. Suchet 8; 18. Schacht 8; 19. Walraven 6; 20. Calia 4; 21. Castellarin 4; 22. Egea 2; 23. Moser 2; 24. Alarcos 1; 25. Ayer 1. Manufacturers: 1. Ducati 90; 2. Kawasaki 83; 3. Honda 38; 4. BMW 31; 5. 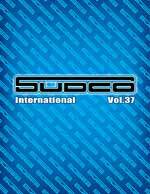 Suzuki 6; 6. Aprilia 4. The Ultimate 2nd Generation Ducati Superbike! 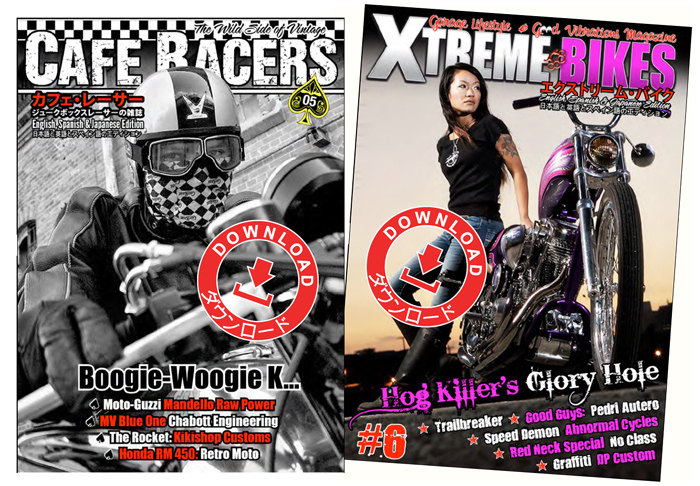 Shinya Kimura / Chabott Engineering, Adrian Packet / Canyon Motorcycles and many more! June 24th 2014 -The FastDates.com Calendars and producer / photographer Jim Gianatsis are excited to announce an agreement with SBK World Superbike and the international model agencies PetrasAngles.com and UmbrellaGirlsUSA.com o bring beautiful Czech Republic SBK grid girls Jitka Pralinka and Petra Ruzinka to the United States this July 2014 to appear at the Mazda Raceway Laguna Seca United States SBK World Superbike and AMA National race weekend July 11-13th, and the LA Calendar Motorcycle Show in Malibu on July 20th. The 1997 Fast Dates World Superbike Calendar photographed at 1995 Laguna Seca WSBK featured official Fast Dates SBK grid girls (left to right) Robin Hill, Anna Keller, Michelle Anthony and Valerie Bird with soon to be 1995 SBK World Champion Carl Fogarty's factory Ducati 955 F95. It was 20 years ago in 1995 that SBK World Superbike first came to Laguna Seca, and producer Jim Gianatsis began working with WSBK producers Maurizio and Paolo Flammini. That year Jim first provided the beautiful FastDates.com Calendar Kittens, who are already at the track on race weekend to shoot with all the top factory World Superbikes, to also serve as the official SBK grid and podium girls on race day. The new 2015 Fast Dates World Superbike Calendar photographed at 2013 Laguna Seca WSBK features official Fast Dates SBK grid girls (left to right) Hannah Flattery and Jessica Harbour with 2013 SBK World Superbike Champion Tom Sykes' factory Kawasaki ZX10 R13. 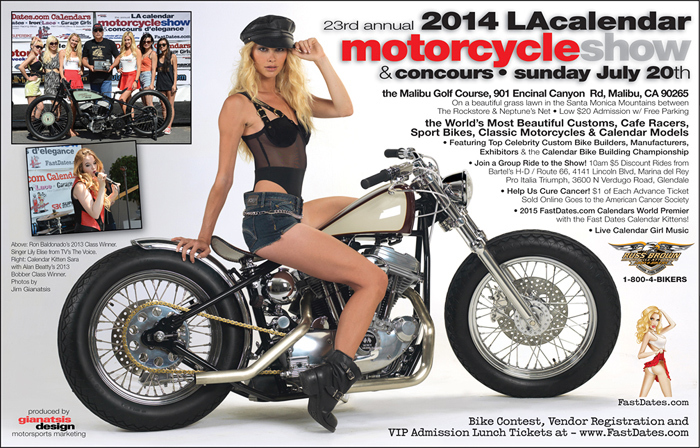 Following the Laguna Seca WSBK weekend, the two Czech supermodels will be visiting and shooting in Los Angeles with Jim Gianatsis, and appearing at the 23rd annual 2014 LA Calendar Motorcycle Show & Concours on Sunday July 20th, held this year at the Malibu Golf Course. 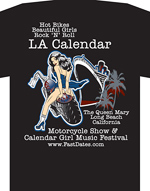 The Calendar Motorcycle Show continues its tradition as the premier outdoor streetbike event in America with the Calendar Bike Building Championship & Concours d' Elegance, top Celebrity Custom Builders, selected Vendors and Exhibitors, and the Calendar Girl Music Show. The Show always kicks off the world premier of next year's new 2015 FastDates.com Motorcycle PinUp Calendars featuring the world's top road race and custom motorcycles with the beautiful Calendar Kittens featured in the Calendars in attendance at the Show. 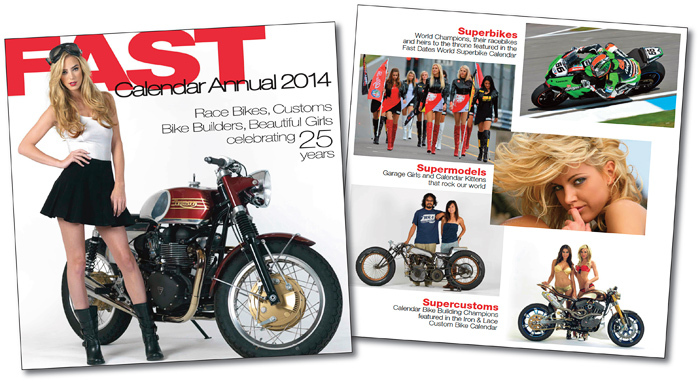 The new 2015 Fast Dates World Superbike Calendar features Fast Dates SBK grid girls (left to right) Jitka and Petra. Both Jitka and Petra will join Jim in premiering the new 2014 FastDates.com Calendars at the Show and fans will get to meet them in person, have an opportunity pose with them and bikes for professional pictures by HighwayPhotos.net, and purchase autographed copies of the new Calendars. On Monday following the Show the girls will also be shooting with the winning bikes and builders at the Calendar Show for next season's Calendars. Supermodel Melena Costa and a Sportster Cafe Racer. Russ Brown Motorcycle Attorneys invites you to save big and meet racing celebs at the FIM Superbike World Championship which returns to Mazda Raceway, Laguna Seca on July 11-13th 2014. Come by the Russ Brown Motorcycle Attorneys booth on Saturday, July 12th between 10 AM and 11 AM to meet former American Grand Prix motorcycle racer, Wayne Rainey and Cycle News Editor, Paul Carruthers. Advance ticket sales end on July 7th, 2014 at 4 PM so don't miss out on this chance to save big on this event featuring two races with high performance riders, teams and manufacturers. With about 25 riders lining up on the starting grid, the competition promises to be fierce. 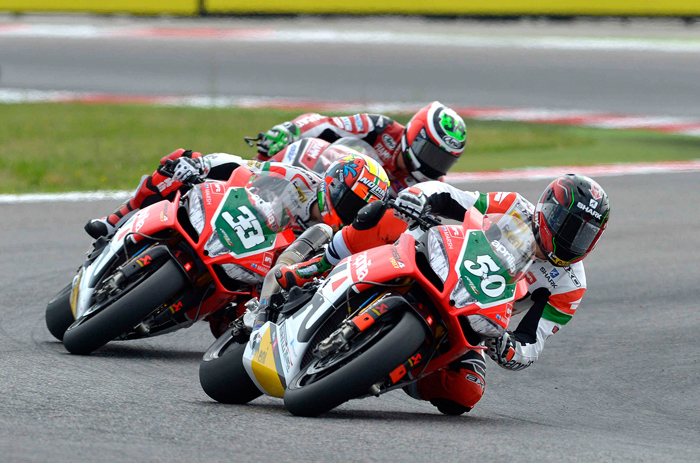 Misano Adriatico (Italy), Sunday 22 June 2014 – The Ducati Superbike Team and riders Chaz Davies and Davide Giugliano experienced a more difficult race day than they had perhaps expected today at the Misano World Circuit. After strong performances by both riders throughout the practice and qualifying sessions, Davies closed race 1 fourth before retiring from race 2 after a crash, while Giugliano battled his way to eighth and ninth position. Race 1 - Conditions were warm and dry for the first race with a track temperature of roughly 38°C. Giuugliano, starting from second place, was lying fifth through the opening corners, with teammate Davies hot on his heels in sixth. After only a few laps the Ducati Superbike pair swapped place, with Chaz able to increase his pace through the central phase of the races. Davide, held back by bike vibration issues, maintained sixth place for the best part of the race, but from the fifteenth lap onwards the problems became more difficult to manage and, also due a drop in rear grip in the final stages, the Italian rider was passed by two riders to cross the line in final eighth position. Chaz, fifth at lap seven, pushed hard to reach Melandri, managed to get to within 0.2 of a second within the space of only a few laps. He did all he could to pass him but had to settle for fourth position in the end. Race 2 – the track temperature had risen to 44°C for race two. Having changed tyre, Giugliano got off the line extremely quickly to position first. Unfortunately he then received a ‘ride through’ penalty as his start was considered to be a jump start by Race Direction. As a result the Ducati man went from first to seventeenth after completing the ride through on lap five. He immediately fought back, pushing to move through the field and was up to thirteenth by lap nine and ninth by lap twelve. Unfortunately the gap between him and the eighth placed rider was too large and although he did his best to reduce the distance, he was unable to gain any more positions, therefore closing in final ninth position. Chaz too started fast and was lying fifth by lap four. Unfortunately he then suffered a small crash at Turn 4 when, pushing on entry, he lost the front of his bike. Although he was able to return to the track without issue, he was down in 24th position. 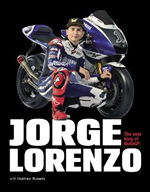 The British rider decided to remain out on track, in case something happened to cause a race restart, but once he’d completed fifteen laps, two thirds of the race distance, the rider returned to the garage. After seven of fourteen scheduled rounds, Davies holds sixth position in the general standings, with 143 points, while Giugliano is seventh with 111 points. 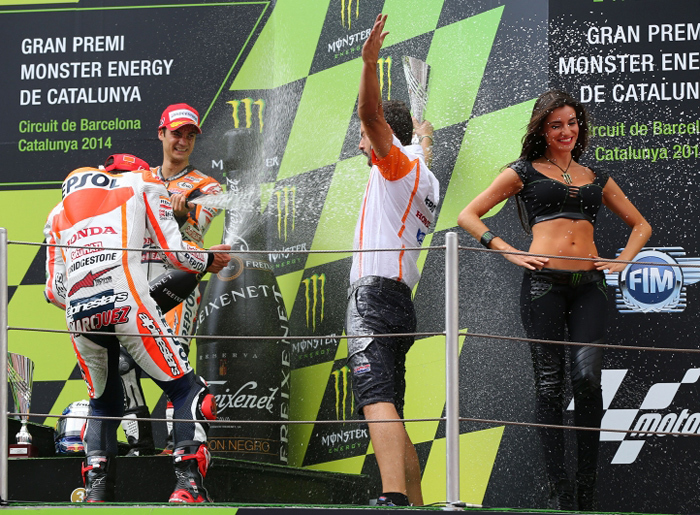 Ducati lies fourth in the manufacturer’s classification with 178 points. Chaz Davies (Ducati Superbike Team #7) – 4th, DNF - “Fourth in race one wasn’t bad. In the final stages I was riding at the limit and although I got close to Marco at one point, he was able to pick up the pace at the end and I couldn’t match that. I’m a bit frustrated about the time I lost at the start when Elias ran off track – he was right in front of me and I was forced to brake.